Even the kids that have been looking forward to the summer time pretty much since the school year began get tired of summer in early to mid August as late-summer boredom kicks in. Their excitement is especially sparked when all the back-to-school shopping starts taking place, as every kid is excited to show off their new school gear to their friends in class. Unfortunately, not every kid in school is lucky enough to get everything they need to be successful in the new school year. Many families are still struggling in today’s economy and just cannot afford what their children want, let alone what they need. Enter the Boys & Girls Club and Capital Alliance, who partnered together to host a “Back to School Relay Race”, which created a fun atmosphere in which kids competed in a race to complete activities themed towards school day preparedness. 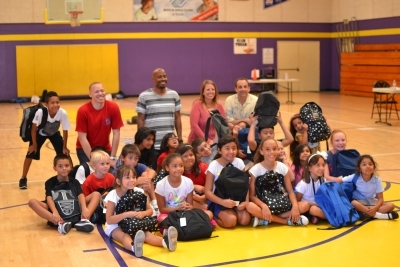 Participants received backpacks stuffed with school supplies, which were provided and hand-packed by Capital Alliance of Santa Ana staff and complete with a heartwarming hand-written message in each backpack for the children. “It’s tough times, but fortunately the Boys and Girls Club of Tustin is here to lend a helping hand,” Jamie Ruiz of Santa Ana is quoted as saying. He brought his daughter, and she had a blast participating in the Back to School Relay Race. Posted on July 30, 2014 by agnesdtodd	Bookmark the permalink.